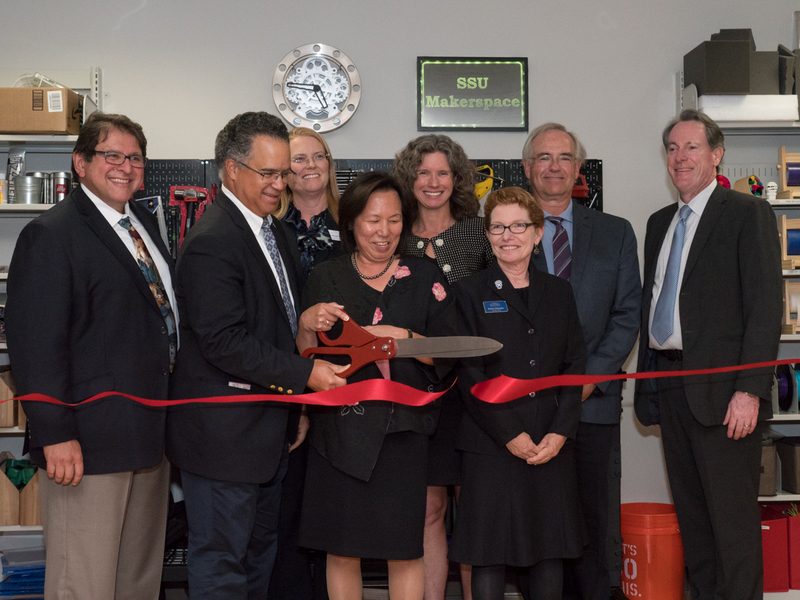 Sonoma State University ushered in a new era of hands-on learning with new technologies like 3D printing, laser etching and virtual reality with the grand opening of the new Makerspace Oct. 3 on the second floor of the University Library. 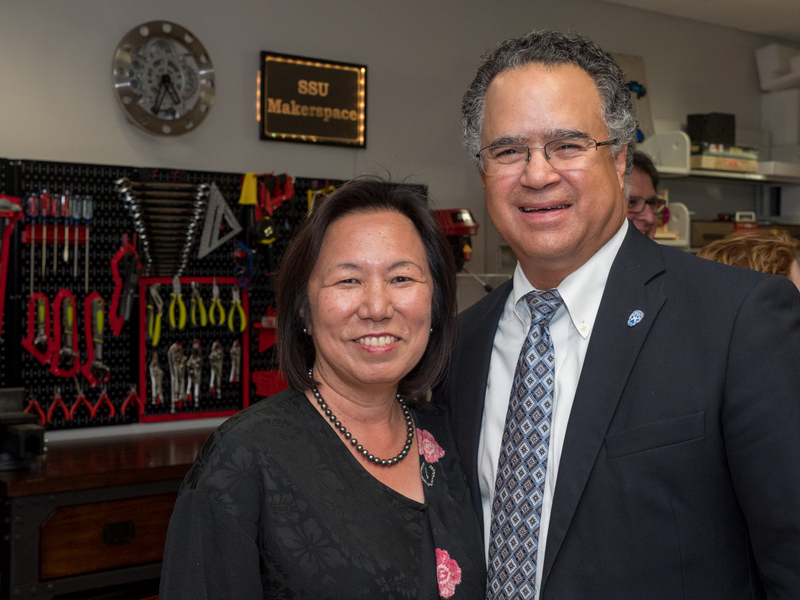 “Our makerspace, like our region, is a home for all who wish to tinker, create and to dream,” said President Judy K. Sakaki. The Makerspace is a learning laboratory in the tradition of the Make Movement that allows students, faculty and staff to tinker with tools that aren’t found in a traditional classrooms or labs. 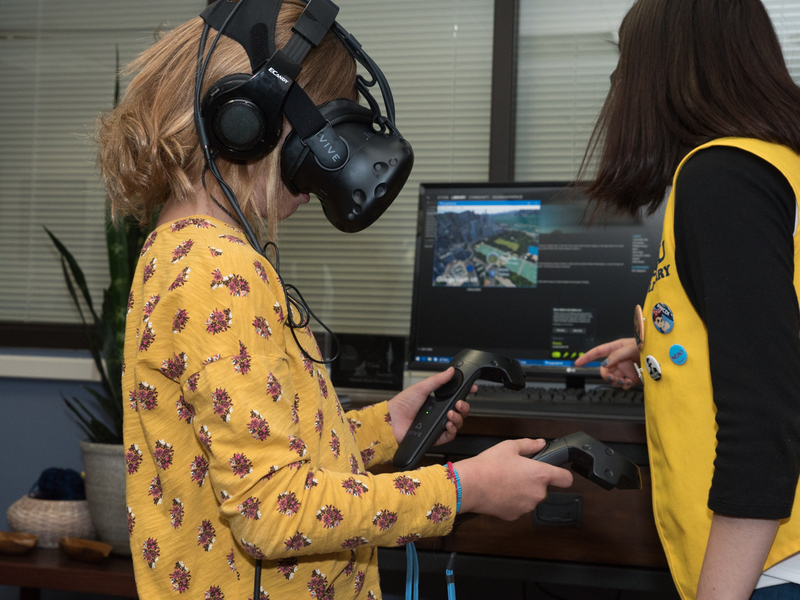 “I want to note how exciting it is to see this space, which once served as closed shelving for old technology like LP records, cassettes and VHS tapes transformed into a vibrant laboratory for hands-on experiential learning of the 21st century,” said Library Dean Karen Schneider. Nearly all the university’s seven deans were in attendance to symbolize the interdisciplinary benefits of the new facility. Lynn Stauffer, dean of the School of Science and Technology, said chemistry students have already benefitted from using the new space by building tools to allow them to handle lab samples in a way that enhances their research results. The Makerspace had a soft opening at the beginning of the semester. 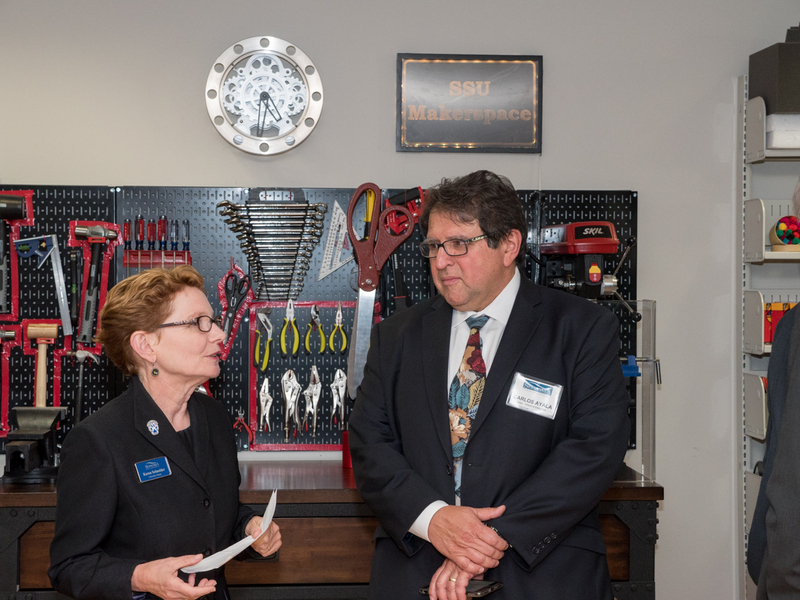 A grant of $584,705 from the National Science Foundation (NSF) was awarded to SSU last year to create a signature Maker program with a Makerspace on campus for students, faculty and staff to use free of charge. Physics Professor Jeremy Qualls, founder of SSU's Makerspace, worked with Physics and Astronomy Chair Lynn Cominsky and others on the grant. 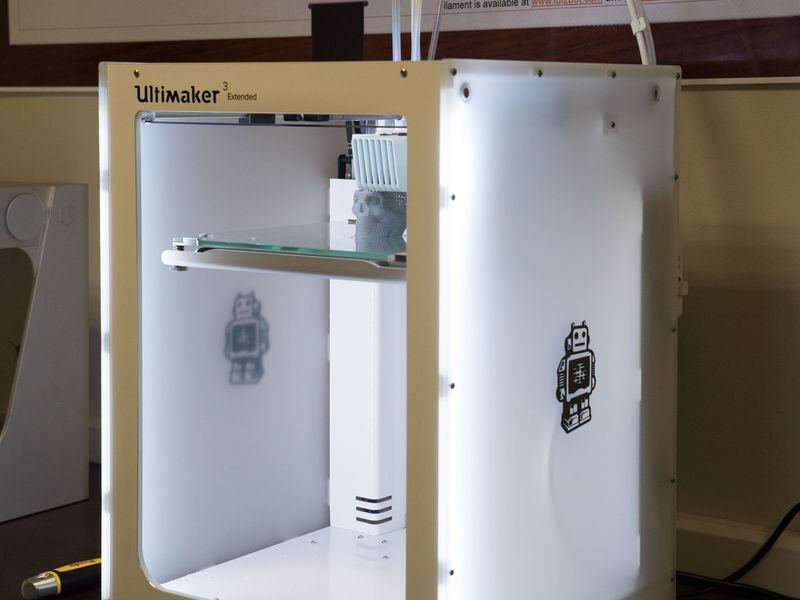 The grant tripled the size of the previous makerspace, which contained only three 3D printers for student use in a small room. The NSF grant also brought forward the development of the new General Education course, Science 220: Dream, Make, and Innovate, which started this semester and uses the Makerspace as its lab. The new Maker program encourages cross-campus academic partnerships for students to explore their own creativity, regardless of major. "We want students to know that whether their major is engineering science, business, psychology, communications or anything else, they are encouraged to come create and build with us," said Qualls, who teaches Science 220 and serves as director of the Make@SSU initiative. Sonoma State is one of five California State University campuses with a Makerspace. The University Library is home to one of just four Makerspaces in the North Bay. "The Maker Movement is internalizing how we see ourselves and how we build things from the inside out," said Qualls. "A lot of people who don't ever take sciences, or are bad at math, they feel intimidated by someone else's skill set. The mindset is, 'There's something wrong with my car, I'll just take it to the mechanic.' I think that a lot of that can be overcome with this kind of environment where anyone is able to design and make things on their own." 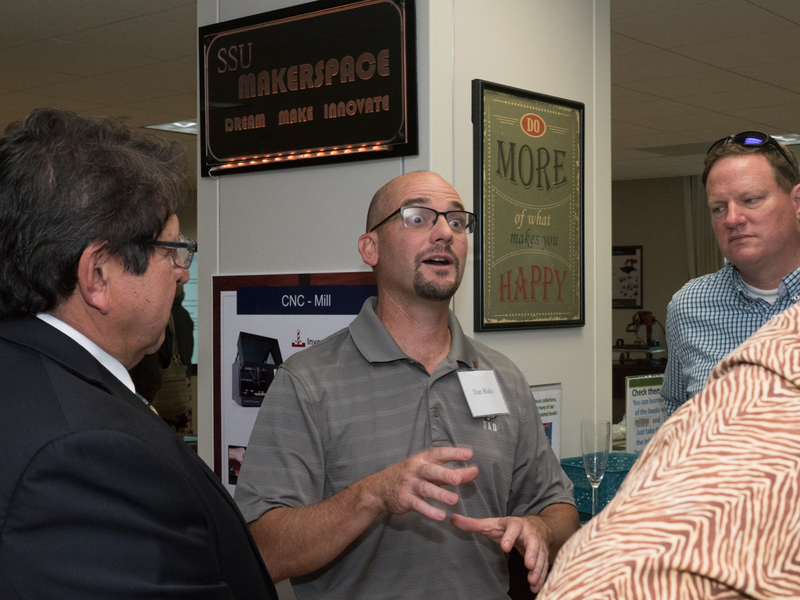 The newly opened Makerspace builds on the University’s commitment to Maker education, which began in 2014 with the introduction of the School of Extended and International Education’s Maker Certificate program for teachers. The program’s popularity has expanded it to include an online certificate to allow educators throughout the state to learn about applying Making in the classroom. The fact that the Makerspace is in the library is fitting, as the Jean and Charles Schulz Information Center, which houses the University Library, was hailed as a technological milestone when it opened in 2001. At the time, Sonoma State known as a high-tech campus, being one of the first universities in California to require all incoming students have access to a computer. Sonoma State University History Professor Samuel Cohen and Physics Professor Jeremy Qualls are recipients of the University's 2017-18 Excellence in Teaching Award. 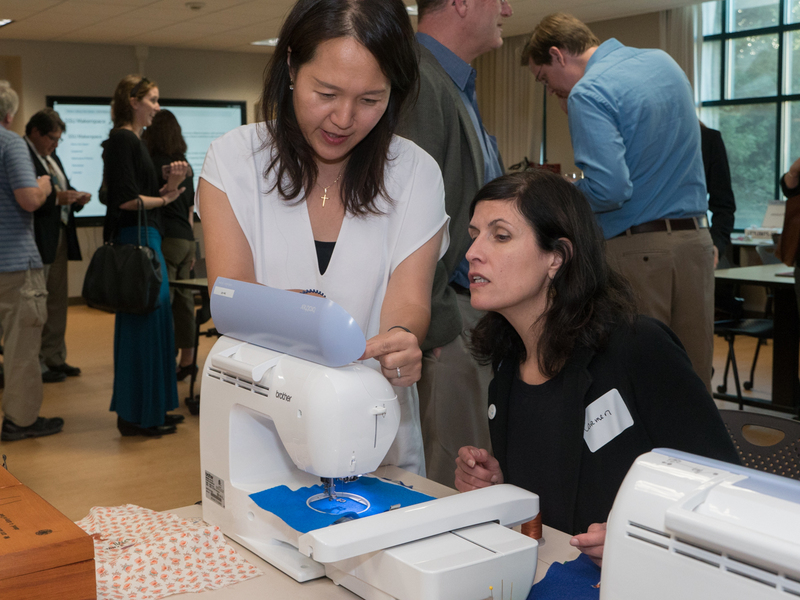 Sonoma State University has received a grant from the National Science Foundation of more than half a million dollars to create a signature Maker program with a Makerspace on campus for students, faculty and staff to use free of charge.